Fewer taxpayers will have to pay the alternative minimum tax (AMT) because of changes resulting from the Tax Cuts and Jobs Act (TCJA). Tax reform provides for a 30% increase in the AMT exemption amount. 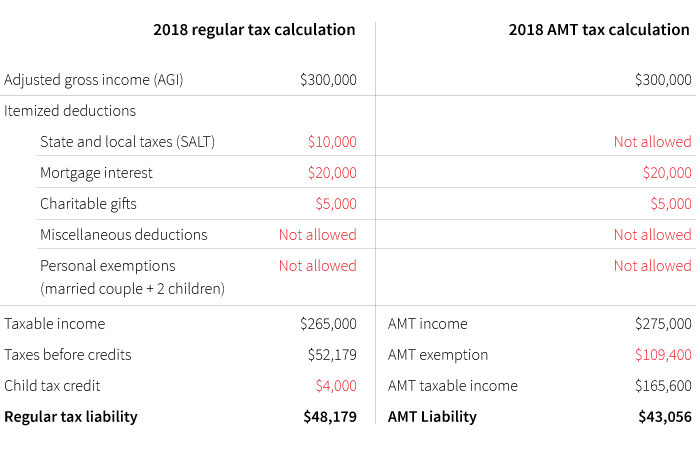 The AMT exemption amount is the amount a taxpayer is allowed to exempt from alternative minimum taxable income before calculating AMT liability. Under the TCJA, the exemption rises to $70,300 in 2018 ($109,400 for couples filing a joint return), from $54,300 in 2017 ($84,500 for couples filing a joint return). There is a significant increase in the phase-out amount for the AMT exemption. The phase-out amount increases to $500,000 in 2018 ($1 million for couples filing a joint return), from $120,700 ($160,900 for couples filing a joint return) in 2017. For every dollar of AMT income above those thresholds, the AMT exemption amount is reduced by 25 cents. As a result of increasing the phase-out amount, more taxpayers will benefit from using the AMT exemption. The tax law scales back popular tax preference items. Historically, taxpayers who claimed high amounts of certain tax benefits (state and local taxes, personal exemptions, miscellaneous deductions) were more likely to be subject to AMT since the calculation for the AMT did not allow these types of deductions. Since the new tax law eliminates or limits many of these tax benefits, it’s less likely they will “trigger” the AMT liability. Will you likely owe AMT in 2018? The following example illustrates the impact of the TCJA on AMT. First, consider a married couple with two children and $300,000 in income. Assume they live in a state with relatively high state and local taxes. This graphic compares their taxes in 2017 versus 2018 under the new rules. For 2017, the couple would be subject to AMT since the AMT calculation yielded more in taxes (a tax bill of $57,459). 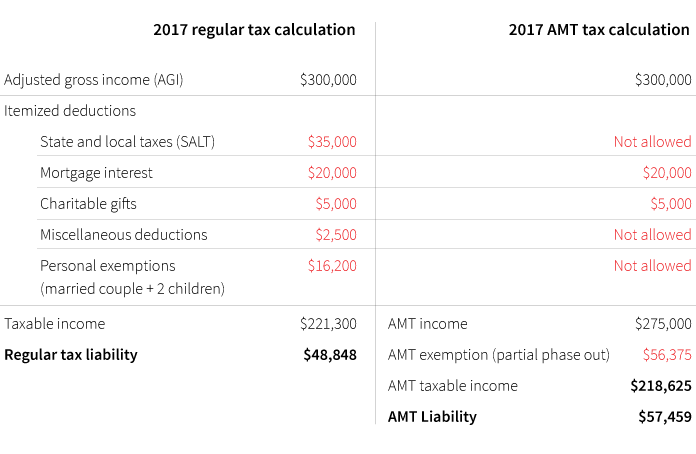 The amount of AMT is the difference of their AMT liability minus their regular income tax liability, or $8,601 in this case. Note: Beginning in 2018, the TCJA eliminates personal exemptions and miscellaneous deductions while limiting the deduction for state and local taxes to $10,000 total. Additionally, the child tax credit is increased to $2,000 per qualifying child (from $1,000 in 2017) with the phase-out for couples filing a joint return increasing to $400,000 (from $110,000 in 2017). In this case, the regular tax liability exceeds their AMT liability ($48,179 to $43,056), so they would not be considered subject to AMT. In fact, their total tax bill under the new rules decreases significantly from $57,459 in 2017 (based on the amount of tax calculated under the AMT rules) to $48,179 in 2018 (based on the calculation of regular income tax under the TCJA). Taxpayers who have been subject to the AMT in the past, may want to discuss the new tax law with a financial advisor or tax professional since there will be a good chance they won’t be subject to AMT in 2018. The new law brought many changes to deductions and credits, and how taxes, including AMT, are calculated. A review of the law can help taxpayers as they focus on financial planning for the coming year. * Tax Policy Center, Effects of the Tax Cuts and Jobs Act: A Preliminary Analysis, June 2018. Examples are for illustrative purposes only.